The speed of a Stanley on the open road is controlled with the throttle lever located under the right side of the steering wheel. With the speed of the car controlled by a lever only two pedals are on the floor. The right pedal is the foot brake for slowing and stopping the car. The left pedal serves to "hook-up" the engine as well as put the engine in reverse so the car can move backwards. With a Stanley Steamer, the engine's motion is literally reversed (the crankshaft spins in the opposite direction that it does when the car is moving forward). The left pedal, when fully released, allows the engine to move the car forward as the throttle is opened to apply steam to the engine. When the left pedal is fully pressed and held to the floor, while the throttle is opened to send steam to the engine, the engine moves the car backwards. Unique to the steam engine is it's ability to run as fast in reverse as it can in the forward direction. Early Stanley engines applied steam for nearly the full length of the stroke of the engine. It wasn't until the cars had been in production for a few years that the ability to "hook up" a Stanley engine was incorporated into the design. As the steam engine picks up speed, steam is being admitted to one side of the piston and then the other (thus the term "double-acting piston"). While steam is admitted to one side of the piston, it is exhausted to atmosphere from the opposite side of the piston. For maximum efficiency of the engine, the exhaust needs to leave the cylinder as fast as possible in order to maintain maximum pressure differential across the piston (boiler pressure on one side of the piston and atmospheric pressure on the other side of the piston). As the early cars could not travel too fast due to the road conditions, exhausting the steam from the cylinders wasn't an issue. However as roads improved, the cars picked up speed, and soon the steam engines were becoming "exhaust constricted". By becoming exhaust constricted or exhaust limited, the differential pressure across the piston decreased (thus making the engine less efficient) due to the exhaust steam not being vented from the cylinder and engine fast enough. Thus the functionality of a "Johnson Bar" as they were called on locomotives, or more correctly an "engine hook-up" pedal was designed into the Stanley engine. In the photograph above the foot brake is to the right and the hook-up pedal is to the left in the highlighted area. 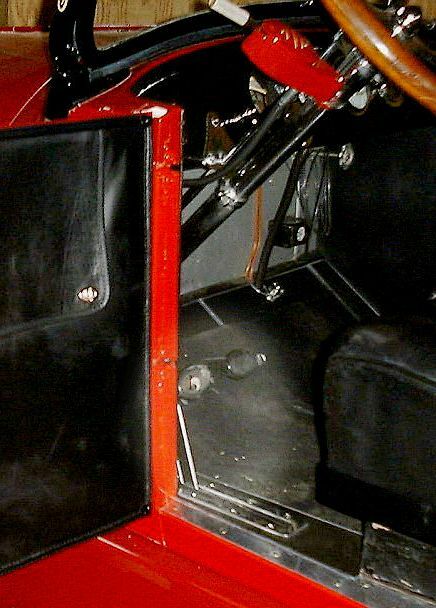 The foot pedal that originally served to only reverse the car was modified with an intermediate latching position to provide "hook-up" for the engine. Hooking-up a steam engine is also known as controlling the "cut-off" of the cylinder since "hooking up" a steam engine is effectively controlling when steam is "cut off" from entering the cylinder and pushing against the piston at boiler pressure. When a steam engine is operating "hooked up" it means that the steam is only being admitted to the cylinder for a small amount of time (or more correctly for a short distance of the stroke). Thus with the hook-up pedal released, steam was admitted to the cylinder for most of the motion of the piston (generally steam was applied to the piston for about 80% or 4" of the piston's total travel). However, once the car reached about 15 MPH the hook-up pedal was partly depressed until it latched. 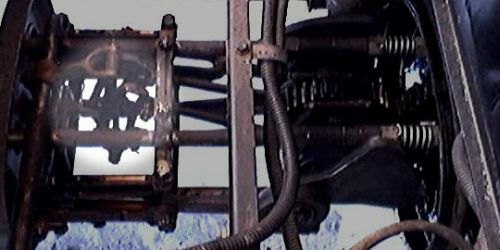 In latching the hook-up pedal at an intermediate position, the Stephenson Valve Gear changed the steam admittance to the cylinder such that steam was admitted to the cylinder for approximately 20% or 1" of the piston's total travel. In the photograph above you'll note a small button in the surface of the hook-up pedal. This button releases the pedal and engine from operating hook-up. When the engine is placed in hook-up the pedal only (the button is not pressed with the foot) is pressed down until the button pops out from the surface of the pedal. When the button pops from the surface of the pedal, the hook-up pedal is latched in position and the engine's valve gear is held in the forward hooked-up position. Running hooked up is the most efficient operation for a Stanley Steam Engine. When the car slows to a stop, and just before it comes to a stop, the pedal and button are pressed together. This causes the hook-up latch to release and the pedal will return to the full "up" position. With the pedal fully up the engine is no longer operating hooked-up. A Stanley is always started from rest with the engine not hooked up and when the speed reaches 10 MPH or so the hook-up pedal is pressed and latched to place the engine valve gear in hook-up. Hooking up or changing the engine's cut-off accomplished two major improvements to the engine's performance. First with less steam being admitted to the cylinder there was less to exhaust and thus the engine would no longer reach an exhaust limited stage of operation at higher speed. Secondly, by allowing the steam to expand in the cylinder (i.e. allow the pressure in the cylinder and on the piston to drop from boiler pressure to something less) used the expansive energy of the steam to propel the car as well as using the direct boiler pressure. Some manufacturer's referred to the hook-up pedal as the "steam-saver" since engaging the steam-saver pedal effectively reduced the amount of steam admitted to the cylinder. Whether called a hook-up pedal or a steam-saver pedal, the result is the same and that is to reduce the amount of time steam is applied to the cylinder and piston thus using more of the expansive energy of the steam to propel the vehicle while also insuring at higher operating speeds the engine doesn't become exhaust constricted. In the video, the engine is already running but it is not hooked-up. Part way through the video the hook-up pedal is pushed and latched at the intermediate position. The position of the throttle is not changed until the end of the video when it is closed. You'll see the hook-up lever shift the Stephenson Valve Linkage from the not hooked-up position (highlighted in the not hooked up position in the photo above from the video) to the hooked-up position (see photo below). The photo above captured from the video shows the Stephenson Valve Linkage in the hooked-up position (note that the yoke is in a lower position than in the upper photograph). In the hooked-up position the steam is now admitted for 20% of the pistons' stroke in the cylinder instead of 80% of the stroke. After the engine is hooked-up you'll also note that it runs slower. This is because less steam volume is being admitted to the cylinders and thus more of the energy of the steam is being extracted to run the engine. The 20-horsepower Stanley engine has a bore of 4" and a stroke of 5" for a cylinder volume of 62.832 cubic inches. When not hooked up steam at boiler pressure (typically between 500 and 600 PSIG) is admitted for 4" or 80% of the stroke and occupies a volume of 50.265 cubic inches. The steam expands into the remaining 1" of stroke or 32.566 cubic inches of cylinder volume when the Stephenson Link Valve Gear closes off the steam supply to the engine. This means that with a boiler pressure of 600 PSIG pushing the piston along in the cylinder for the first 4" of the stroke, the pressure against the piston will drop to 480 PSIG (assuming constant temperature after the expansion) by the time the piston has moved the full 5" of stroke. However when the engine is hooked-up, steam is only admitted for 20% or 1" of stroke (32.566 cubic inches of volume) and it has to expand the remaining 4" of the stroke or into the remaining volume of 50.265 cubic inches. This means that with a boiler pressure of 600 PSIG pushing the piston along in the cylinder for the first 1" of the stroke, the pressure against the piston will drop to 120 PSIG (assuming constant temperature after the expansion) by the time the piston has moved the full 5" of stroke. There's a loss of 360 PSIG of force on the piston at the end of its stroke due to the engine being hooked-up. As the wheels are off the ground and thus the engine is only having to overcome the friction of the bearings, etc., the reduction in force on the piston results in a reduction of the speed the wheel turns. Also, when the video was made the throttle only had to be "cracked open" just enough to get the engine to turn over and thus the steam supply to the engine is very minimal. In actual operation on the road the throttle allows a much higher volume of steam to flow to the engine. Had "road power" steam flow been applied to the steam engine during the making of the video the engine probably would have self-destructed do to the speeds reached and the forces being generated. Thus the operating conditions during the making of the video are somewhat different than in actual road driving. On the road the engine doesn't slow in speed as dramatically as shown in the video. Additionally, with a higher volume of steam flow to the engine while driving on the road, the cylinder exhaust pressure becomes a larger factor in what happens. In the video the rear axle of the car is supported on a pair of jack stands so that both rear wheels are free to turn. Due to the operation of the differential the left wheel has been chocked to keep it from rotating so that only the right wheel rotates. As the video starts, steam has been applied to the engine and it is running to move the car forward. The clip is silent and does not have any audio. After a few seconds of operation the engine will be hooked-up (you'll see the valve gear changing position as shown in the photos above). Towards the end of the video the throttle will be closed and the engine will drift to a stop. To view the video, click the START button (lower left triangle). The video will start and run to conclusion. The video lasts one minute and twenty seconds and is nearly 8 megs in size. It will take a few minutes to download.